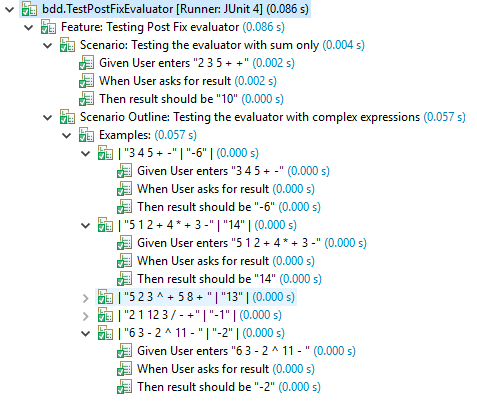 In this article we will look at how to develop an postfix expression evaluator using BDD approach. Our evaluator would handle Addition, Subtraction, Multiplication and Division of floating and integer numbers. In BDD we first write acceptance tests. These acceptance tests are tests which would test the complete module/application there by declaring it to satisfy the user requirements. And these can be captured at the time of creating the acceptance criteria for a user story (concept widely used in scrum based agile software development methodology). These tests tend to be more user requirement focused and are often written in collaboration with the customer or customer representative or the product owner. As the people involved in the development of acceptance tests tend to non-technical, there is a Domain Specific Languge (DSL) available which helps in capturing the acceptance tests. This DSL is called Gherkin. And a tool called Cucumber helps in generating tests and then executing them. This generation and execution of tests is all behind the scenes and is carried out by the developer. Then the result should be "pqr"
The above feature file is pretty clear and is mostly english language based. (This is the beauty of DSLs). There are few key words in the above file like Feature, Scenario, Given, And, When, Then and few more. And there are some restrictions like there can be only 1 Feature, And at the beginning of new line should be And and not and, then and can occur with in the sentence as normal and and so on. (I know too many ands). But such restrictions are what is imposed by the DSL. Generating such feature files is quite simple and we can easily collaborate with stakeholders to capture their requirements and specifications by using examples and these examples can be written in form of Scenarios. The developer can take this feature file and generate java code. This java code is nothing but collection of methods backing each Given, When, Then clauses written in the feature file. There are different ways to generate it and I will show you one such way in this article. Let us now dive into the code. Given User enters "2 3 5 + +"
Then result should be "10"
You know Scenario, but what is this Scenario Outline? It is a parameterized version of Scenario which means that the Given, When, Then specified for the Scenario Outline are executed for each of the test input provided in the Example section. But how do we link the Examples and Given, When, Then? The first row of the Example section indicate the name of the variables to which the value is assigned. And the same variable name can be used in the parameterized clauses of Given, When, Then. And you parameterize the clauses using . 4. If you have come to the end of expression then pop the stack to get the result. 3. If on encountering an operator, we dont have enough operands in the stack, then the expression is invalid. 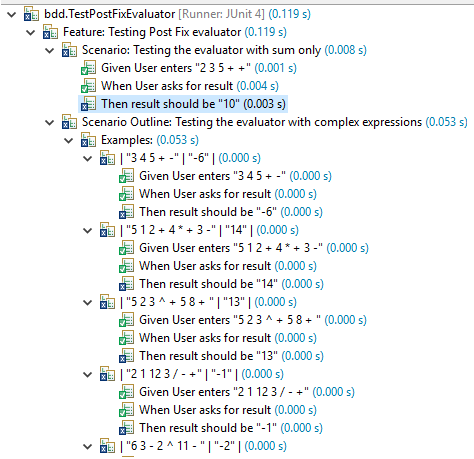 We can update the PostFixEvaluator class with the code below (I havent considered error scenarios. We can easily add some negative tests and then write code to pass those negative tests, refactoring becomes easy as we already have tests for our feature). It is a pretty naive design, one can refactor and also refactor to use Strategy design pattern. This is all possible because we have acceptance tests, if we make some error during the refactoring, then the acceptance tests will flag them. This was a simple introduction to BDD. In the next article I will show how we can apply TDD exclusively and then an article with a mix of BDD and TDD.